I was so excited to find this machine in such great condition. This later model even has reverse which is a real bonus. Plus it came with the original owner’s manual and a box of attachments. It just needed a new belt as the old one was dry rotted and broke. So I oiled it all up and installed a new belt, it was time to test it out. I threaded it all up and after a few starts to get the hang of treadling again, it sewed like a charm. You see I haven’t used a treadle machine in over 40+ years. 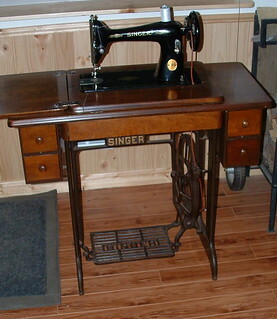 When I was very young, we had a black Singer 66 treadle in my Dad’s farm shop. He let me “play” on it and this is how I first learned to sew. I made doll clothes and learned to do basic stitching. Anyway this is how I first started sewing and making things by hand. That old sewing machine is long gone but I’ve always had a soft spot for treadles. In the future I will share some sewing projects and recycled materials ideas that I have made using my treadle. I hope you have enjoyed seeing my acquisition and if you weren’t already familiar with a Singer treadle, maybe you will have a new appreciation for this vintage beauty. You are SO lucky. The photos bring back memories of home ec classes-I’m sure that we used this model in junior high sewing. Have fun sewing with it – I’m sure that it has many years of sewing left in it. I learned to sew on this machine. My mother had one at home and there was one at the Community Center where the 4H Club bet. Eloy Arizona. I have often wished I still had it. My mother had it motorized. My favorite Singer is the Featherweight and I still have it. I am 73. Aww in our country some people still using it.. I remember my mother was using it. 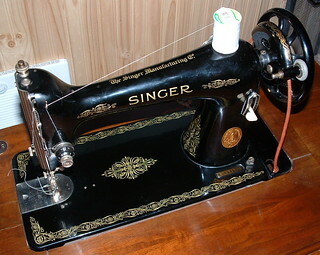 I know for sure that however old these singers are, they are better than the newest sewing machines. My wife has inherited a baby like this from her grandmother, and he’s extremely happy about it!